Sophomore students Rubble Ejigu, Leslie Davis and Abena Sefa prepare for the Sophomore Pinning Celebration. In a world with dramatically changing demographics, it’s important to have a healthcare workforce that reflects the population it treats. Similarly, it’s important for Mount Carmel College of Nursing to not only meet this need but also provide opportunities for all qualified potential students and nurture existing students to succeed in their future careers. 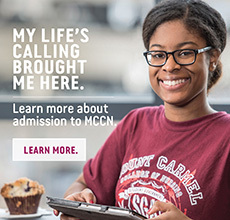 In order to cast the widest net for potential students, MCCN’s Admissions office ensures that they target visits to high schools that have the highest numbers of under-represented student populations. 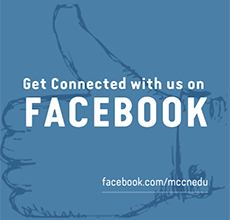 “We try to make sure we cover as many bases we can, not just the suburban districts,” said Kim Campbell, MEd, director of admissions. “We target districts with urban populations such as Columbus, Franklin Heights, Toledo, Cleveland and Dayton to ensure we’re reaching as many under-represented student groups as possible. Right now we’re working with Columbus’ Fort Hayes campus because students with health-centered studies attend there,” she said. MCCN Celebrates the Legacy of Dr. Martin Luther King, Jr.
At Mount Carmel College of Nursing, we celebrate the diversity of our community and students every day. The College supports a culturally diverse and inclusive environment in which differences among our students are recognized, accepted and appreciated. On Monday, January 12, MCCN honored an icon, legacy and inspiration to all, Dr. Martin Luther King, Jr., at an Appreciation Luncheon. Sharon Davies, the Gregory H. Williams Chair in Civil Rights and Civil Liberties and Director of the Kirwan Institute for the Study of Race and Ethnicity, provided insight on her experiences with diversity in a multitude of environments. Read more: MCCN Celebrates the Legacy of Dr. Martin Luther King, Jr.
1. Volunteer service can be one of the following: volunteering at health fairs and screenings, tutoring, assisting in after-school programs, working at soup kitchens and homeless shelters or volunteering at not-for-profit agencies with vulnerable, at-risk populations, i.e., organizations that serve children, elderly, homeless or poor and underserved people. 2. Your community service hours must benefit vulnerable and/or at-risk populations. Your service experience needs to encourage critical thinking about the concerns of our society and help you to develop into a thoughtful leader. 3. You cannot be paid or receive any type of compensation for community service and it cannot benefit a for-profit business. As part of our ongoing series to profile faculty, staff and student representatives, this month we feature Kathy Espy, BA, director of diversity and community initiatives. Please welcome Todd Everett, PhD, as he begins his new role as Director of Financial Aid for MCCN. Dr. Everett comes to us most recently from Xavier University in Cincinnati. Previously, he attained many years of experience in the financial aid arena at University of Findlay and Ohio Northern University. He is also a lieutenant colonel in the US Air National Guard and has military experience as a hospital administrator. He received his PhD in Higher Education from Ohio University, a Masters of Business Administration from the University of Findlay and a Bachelor of Science in Business Administration from Bowling Green State University. Tamara McCarroll is known at MCCN-FMC for her persistent smile on her face and positive attitude. She also is fully engaged in her studies, clinical work and is a serious learner, but what sets McCarroll apart is her passion for volunteerism. Coming from a background where resources were scarce, McCarroll has a deep appreciation for people who helped her family during challenging times. In instilled in her a willingness to give back. “Because we didn't have a lot financially growing up, so many people stepped in our lives at different times and helped us, and because of that, how can I not want to pay it forward?” McCarroll said. Sunday, January 11 marked an exciting and memorable day for 149 Mount Carmel College of Nursing sophomores as they celebrated the Sophomore Pinning Ceremony at First Church of God. Students from both the Columbus and Fairfield campuses participated in the event, which is an annual tradition symbolizing a rite of passage— a milestone that represents a student’s academic achievement and progression toward direct patient care. As part of the ceremony, students received a gold pin embellished with a lamp, reminiscent of the lamp used by Florence Nightingale, the founder of modern nursing, in the Crimean War.